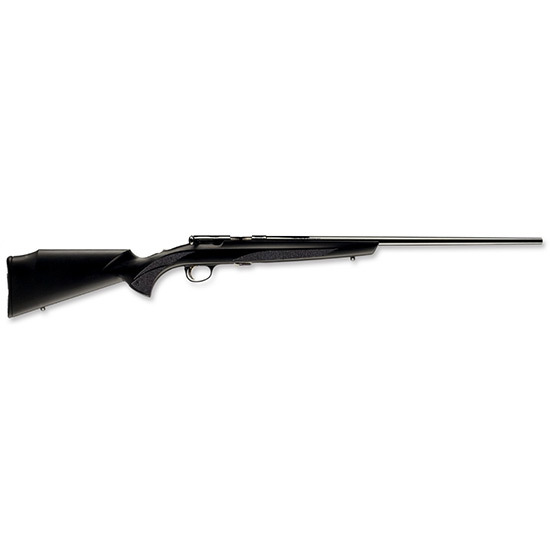 Browning 025180270 T-Bolt Composite Target|Varmint Bolt 17 Hornady Magnum Rimfire (HMR) 22 10+1 Synthetic Black Stock Blued in. The Composite TargetVarmint Model will appeal to those who are serious about accuracy. With a matte black composite stock and heavy varmint barrel that provides pinpoint accuracy this TBolt rivals custom guns costing much more. For some of us those first shots were from an original Browning TBolt one of the most accurate handy and easytoshoot rimfires ever produced. Those days can now be relived with todays TBolt a rifle every bit the equal of the original with several exciting new features that put this unique rifle in a class by itself. These modern versions rely on the classic straightpull boltaction design to chamber each cartridge fed from the new 10round rotary box Double Helix patent pending magazine. The TBolts threelever trigger offers a light crisp break and every barrel is free floating.